Skyler Scarlett, CEO of Glace Franchising LLC and Co-Creator/Owner Glace Cryotherapy LLC. 25 years old, graduated from Chico State in 2012 with a degree in exercise physiology and a minor in nutrition. Lives in Carmel Valley, CA a huge San Francisco Giants fan. Enjoys working out and writing film scripts. Brittney Scarlett-Torres, COO of Glace Franchising LLC and Co-Creator/Owner Glace Cryotherapy LLC, 31 years old, graduated from Chico State in 2007 with a degree in political science and a paralegal certificate. Lives in Sand City, CA. Enjoys reading, scrapbooking & interior design. GLACÉ CRYOTHERAPY is a Cryotherapy spa providing one service-Whole Body Cryotherapy. Our flagship store is in Carmel, CA and we have franchises in CA, NV, OR & FL and are continuously expanding. 2) How did you come up with the idea for Glacé Cryotherapy? My husband first told my brother (co-owner/creator Skyler) about Whole Body Cryotherapy in 2011 when he had a friend who had tried it in Texas. Skyler who has a degree in exercise physiology was immediately intrigued and began researching the therapy. What he found was professional athletes and olympic medalists who were swearing by this therapy. He was able to find a place in Los Gatos where a former Olympic athlete had one of the original Cryosaunas to try it-once he tried it he was sold and soon after brought me to try it and I felt amazing. I told my brother if we were going to do this were going to do it right so we took a trip down south going to the few Cryotherapy places that existed at the time (early 2014) and then went to Texas where we found a growing and thriving industry. We then decided that we wanted to open one in our small hometown of Carmel, CA, although the population is small its the right market so we thought if we could make it work here we can really prove the model and that we did. We opened our doors in October of 2014. 3) What makes it different to all the other businesses which are similar to yours? What makes us different is that we are creating a brand. There currently is no brand for Cryotherapy and when we opened 3 months in we had people coming into us asking how they can join this business venture and open up their own GLACÉ. They knew they could do it alone but saw the value we brought and the value of being part of a brand. We provide a wonderful experience from the moment a client arrives to the moment they leave. We make safety and our clients needs a priority and make sure to properly explain the therapy and its many benefits and get them on the appropriate Cryotherapy plan. We have had people come to us who have tried other Cryotherapy places and state that they would never go back so that tells us we are doing something right. We also are implanting universal access so if you happen to be a member at say GLACÉ Carmel and are traveling in Hawaii well you can use your membership in Hawaii (just like a gym). There is also an art to operating the Cryosauna and with our state of the art training program we feel confident that anyone who partners with us will be a top notch Cryosauna operator. 4) How did your experience on Shark Tank and the investment from Barbara Corcoran help your business? 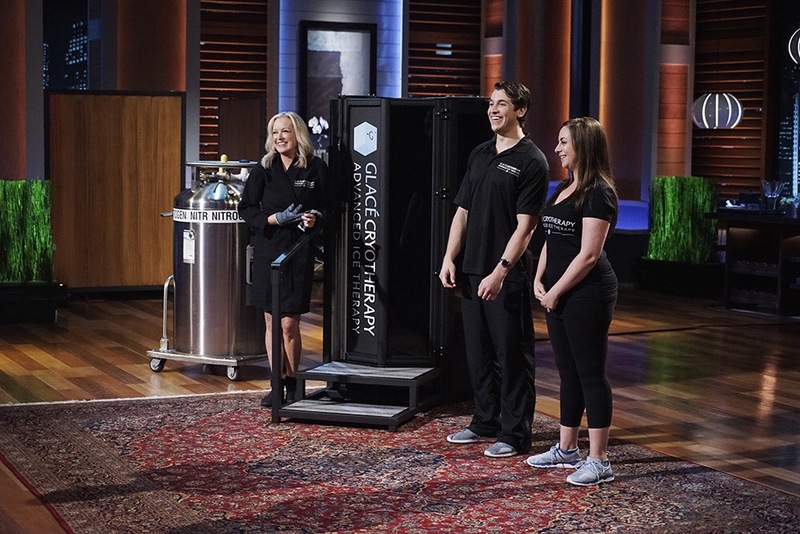 Being on Shark Tank and the entire process to get to that point was a once in a lifetime experience. We learned more about our business then we thought possible. Personally I am a huge fan of the show so actually being there on set was surreal and definitely felt like we were really living the American dream. Barbara and her team were extremely helpful in guiding us to become an official franchise as it was something we wanted to do we just weren’t sure how to start as we were previously advised by attorneys that we were too early. Barbaras team connected us with the Franchise Development Group who have been instrumental in the franchising process, as well as connecting us with a franchise attorney who really has our best interest at hand which is so crucial during this time of extreme growth. We also saw a great increase in franchise requests from going on the show which has been exciting as we hope to have a GLACÉ in every major city. 5) How is cryotherapy effective? Cryotherapy is effective because it decreases excess inflammation in the body and inflammation is the root of many issues. We have seen first hand from our client base of over 1000 people the many benefits it provides. We have clients who have been able to cut their pain medications in half or who have been able to completely stop taking anti-depressants to people who swear by it for recovering after a grueling workout, it really is incredible. Whats neat is people tend to get different things from it as we are all different, where one person is sleeping better another reports more energy, it really is a personal experience. 6) What inspired you to go into business? We were both unhappy with our current jobs. For myself being 5 years older and in the working world ever since graduating from college in 2007 I had never really fond anything I felt passionate about and was just working to live going through the motions feeling every ounce of joy left crumbling as work took up 90% of my time. I knew I had to change my current situation and took a leap of faith when I quit my job early 2014 with no real plan but just to find anything else. It was then that Skyler was really enthusiastic about actually moving forward with this Cryotherapy thing, since I had a ton of newfound free time I decided to try it. As I mentioned earlier I felt amazing after just one session and realized we could really have something special here. Being that the industry in the U.S. was and still is rather new we saw a great opportunity to be one of the pioneers and educate people on this amazing therapy. Skyler on the other hand has always had the entrepreneurial spirit and was never going to be satisfied working a 9-5 so when we saw this potentially amazing industry within arms reach he went for it. When he told our Dad this idea (and there had been many ideas before) he was able to convince him that this was THE idea, our dad sold his house and that was how we were able to finance our Cryosauna. Had we had to go through the banks we may not have been able to open as quickly as we did considering our ages and the fact that we didn’t own any collateral (a house, etc). 7) What advice would you give to aspiring entrepreneurs? Skylers favorite quote is “Doubt kills more dreams then failure ever will.” I think thats an inspiring quote because there will always be people who think your idea is bad or will not work out, you have to just believe in yourself and anything is possible. We have learned a lot on our journey so far and have made mistakes along the way. Business and life in general is peaks and values so when times are down you just have to remember that its only temporary and to just pick yourself back up and keep going. I think its important to find something that you’re good at and enjoy doing and do the very best at it then you will never feel like you’re working a day in your life and life becomes a whole lot more enjoyable. What I love about what we do is the fact that we through this therapy are changing and improving peoples lives and we have been able to make a living doing so, there is nothing better then making people feel better. We would like to thank Skyler and Britteny for speaking with us.